When surgery or treatment for oral cancer affects the patient’s ability to eat, a feeding tube is inserted to facilitate meeting nutritional needs. First introduced in 1980, today more than 200,000 patients every year receive this form of therapy. The location of oral cancers, and the resulting damage to the oral / esophageal tissues from treatments, makes weight maintenance and obtaining proper nutrition especially difficult. Feeding tubes may be inserted through the nasal passageway for short-term use, but for those patients who require longer use of the tube, it is customary to place the tube directly into the stomach through the abdominal wall. This second method is called a percutaneous endoscopic gastrostomy (PEG) tube. The feeding tube may also be put in place in anticipation of other treatments such as radiation or chemotherapy, allowing the patient to adapt to its use prior to treatments. Feeding tubes are not painful and are not easily visible when wearing normal clothes. When not in use, they can simple be taped to the patients stomach to prevent them from moving around under clothing. 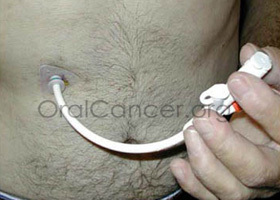 PEG tubes are placed with the aid of an endoscope, the scope going down the throat to assist in guiding the placement of the tube through the wall of the stomach. The surgery is simple and involves little risk or discomfort. The procedure takes about 20 minutes. The PEG tube extends from the interior of the stomach to outside the body through a small incision only slightly larger than the tube itself in the abdominal wall. The tube is prevented from coming out of the stomach by one of several methods. Some brands have a small wire within the tube, which after insertion is pulled from the exterior end of the tubing causing the portion within the stomach to curl up or “pigtail,” preventing it from being pulled out. Other systems employ a very small balloon at the end of the tube which is inflated within the stomach after insertion, serving the same purpose. Removal of the tube simple involves cutting the wire which created the pigtail, or deflating the balloon section of the tube allowing it to slip easily from the stomach. About three inches of tubing will protrude from the incision area. Initially, there may be some discomfort while getting used to using the system, from gas or air, or from adjusting to the liquid foods themselves. Greater care is required during the first week the tube is in place, as the surgery has just been performed. The area around the wound must be kept thoroughly clean and covered with clean, gauze. During this period of time the tube may occasionally pull away from the abdominal wall, resulting in leakage around the insertion site. Leakage may also occur if the stoma site becomes enlarged. Excessive tension may cause the tube to be pulled out prematurely. Should the tube accidentally come out it must be reinstated within twenty-four hours or the incision will begin to heal, and new surgery may be required. The tube is marked at the point where it should be level with the incision and should be checked daily to make that it is still properly in place. Excessive tension on the tube may also result in pressure necrosis (death of an area of tissue) of the interior abdominal wall. The tube is very narrow, and commercial tube feeding formulas such as Ensure, are designed so that they will not clog the tube; they are not too thick and do not leave a residue. Most formulas are designed to have water added to them to ensure that the patient is receiving enough dietary water, and to further thin the formula for ease of use. To maintain patency, the patient should flush the tube with clear water before and after feedings, or after medications have been administered through the tube. The placement of noncommercial formulas or foods into the tube is highly discouraged, as there is a greater likelihood that they will contribute to clogging. After the tube is placed, a registered dietitian or a nurse who specializes in nutrition should assess the patient to determine their nutritional needs, the amount of calories, protein, and fluids that will be necessary, as well as the most appropriate nutritional formula and how much of that formula will be needed each day. Nutritional products designed for tube feeding are formulated to provide all the nutrients the patient will need including proteins, carbohydrates, vitamins, and minerals. Some even contain dietary fiber and other non-nutritional elements. When feeding the patient, it is imperative that the caregiver or patient thoroughly washes their hands with soap and water before preparing formula or having contact with the PEG system. The tube should be checked for patency, and the formula administered at room temperature. The patient should be upright, no less than thirty degrees, to minimize the risk of regurgitation and aspiration, and they should be kept upright for thirty to sixty minutes after feeding. To prevent complications (abdominal cramping, nausea and vomiting, gastric distension, diarrhea, aspiration), food should be infused slowly. It may take more than an hour to administer one feeding session, as the drip mechanism is kept at very slow settings. Sometimes continuous feeding is preferable. 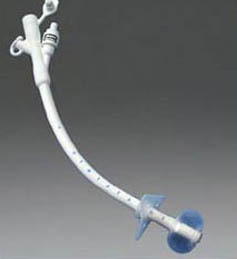 With this method, a feeding pump is set up and connected to the PEG tube. The formula is infused over a prescribed period of time into the patient. The risk for aspiration is decreased because less formula is given during a more prolonged period of infusion. 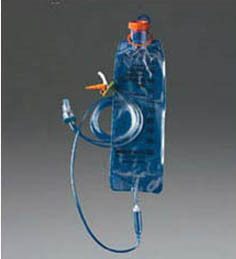 Using an attached bag system to contain the liquid diet for feeding is a secondary method by which food is allowed to drip slowly into the tube though “gravity feeding.” With this technique, there is greater freedom in that feedings can be done anywhere, at any interval, and medications may be administered through the PEG tube utilizing this method. Under the drip-feeding method, feedings are usually performed every four to six hours. Clogging of tubes is regularly reported, especially in small-bore tubes. Tubes should be flushed with water before and after feeding during intermittent delivery, and every 4 to 8 hours during continuous feeding. This is done with a syringe full of water which is attached directly to the tube. Multiple flushings with the syringe will ensure a free flowing system. The patient may experience bloating either before or after feeding. If this occurs, the stomach and intestinal tract should be decompressed. Removing the adapter feeding cap from the tube and allowing the PEG to be open to air can easily accomplish this. Encouraging the patient to cough will also facilitate decompression. Scrupulous oral care is imperative in preventing problems, and must be attended to frequently, especially in patients who are provided with total nutritional support through the PEG tube. Daily brushing of the patient’s teeth, gums and tongue must be performed. The patient’s lips should be routinely moistened, and if necessary, lubricated with petroleum jelly to prevent cracking. The incision area must be observed daily for redness, swelling, necrosis or purulent drainage, and the skin must also be cleaned daily. It helps to routinely apply an antibacterial ointment to the insertion site after cleaning to prevent infections such as Neosporin. For patients who are unable to chew and swallow food, tube feeding can safely and significantly increase the quality of life, maintaining appropriate weight levels and nutritional requirements.